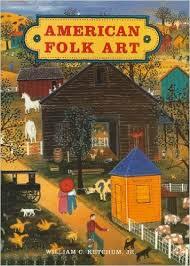 American Folk Art research papers examine the folk art that is produced in cultural isolation by artists or artisans. Folk art is that produced by an indigenous culture. American folk art is anything produced in cultural isolation by artists or artisans. Much American folk art was produced in the 18th and 19th century, although the stylistic conventions persist today. Amateurs, often closer to craftsmen than fine artists, many of whom are self-taught, produce much American folk art. A well-known example of an American folk artist was Grandma Moses. Folk art is specifically isolated from academic and fine arts movements. It was largely the product of rural America, artistic representation along the isolated frontier. Much American folk art was devoted to portraiture. Itinerant painters would roam the countryside, offering commissioned paintings as means of earning a living. Many of them had begun painting furniture or signs, before developing their skills and moving onto formal subjects. Their work became highly illustrative and frequently depicted historical and religious themes, as desired by their customer base. The skewed scale and proportion of the figures, even animals, is representative of their importance in the image. American folk art is not restricted to the past. Numerous folk art traditions, such as quilting, painting using flattened perspective, and carving, thrive across America. Numerous exist celebrating this work, including the American Folk Art Museum in New York City. Paper Masters writes custom research papers on American Folk Art and examine the folk art that is produced in cultural isolation by artists or artisans.